Tampa Bay, FLA (May 10th, 2017) – Evolve & Co, a lifestyle branding firm headquartered in downtown St. Petersburg is credited with the new look behind the revitalization of the historic State Theatre of St. Petersburg’s Central Arts District. The theatre contracted the firm in late 2016 to create a visual identity that would ignite nostalgia and breathe new air into the establishment. The firm’s contract included a logo design, brand guidelines, and a comprehensive website. Evolve & Co is a collective of brand strategists and creatives specializing in lifestyle branding. The team consists of copywriters, graphic designers, web developers, marketers, public relations specialists, videographers, photographers, and more. The firm’s verticals include hotels, dining, beauty, real estate, entertainment, and more. The project kicked-off in the Fall of 2016 with comprehensive research of the theatre’s history, current challenges, and future plans. 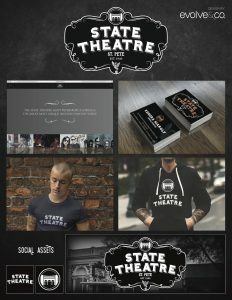 Through interviews with fans, St. Petersburg Chamber of Commerce, the State Theatre ownership and management, bands, and the St. Pete Preservation Society, the team compiled the data to create a visual identity that symbolizes the true essence of who the brand is today, and where the brand is going. “With new ownership and management, we’ve made so many physical improvements from becoming a non-smoking venue to new lighting, sound, curtains, and security measurements. There is new energy and perspective in the theatre, and we intend to bring in a more diverse showcase of talent as well as rent our space for private functions. It was the perfect time to rebrand, and after meeting with several firms, we chose Evolve & Co because we admired their work and felt a genuine investment from them in the long term success of the brand” said Kendra Marolf, General Manager, State Theatre. A primary consideration when emerging with a modernized look was to honor the era in which the theatre first opened its doors. 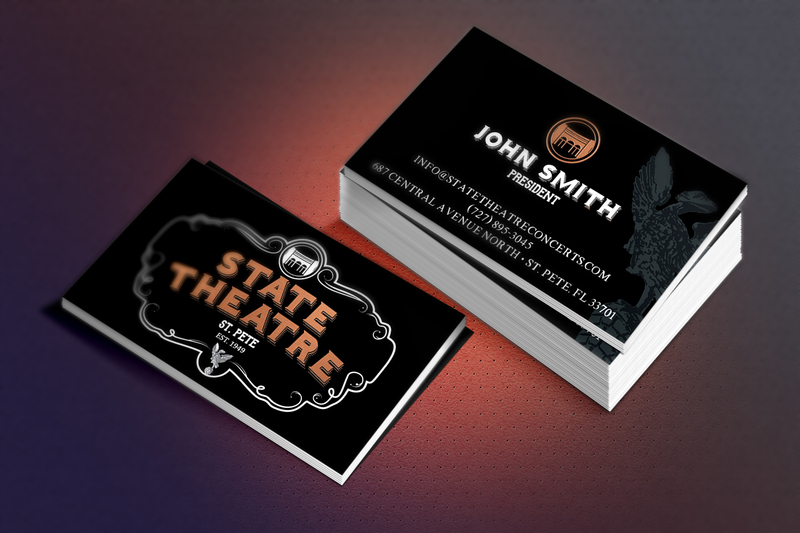 “The new brand reflects the historic background and iconic architecture of the State Theatre. These qualities are showcased through the use of contemporary typography referencing 19th Century American Wood Type coupled with delicate flourishes and accents to embody a sense of timeless beauty while maintaining an essence of modernity” says Craig Whitlock, Creative Director, Evolve & Co.
At 6,000 square feet, The Alexander National Bank became one of the largest of the nine banks in the area, and one of the only banking establishments to print currency locally. To this day, it remains only the second example of a Neel Reid building in St Petersburg. The passing of Jacob Alexander a few years later led to the purchase and transition of the building to The Fidelity Bank and Trust. Opening in July of 1929, and then experiencing the stock market crash only three months later, Fidelity Bank and Trust, along with many local businesses, never recovered. Sadly, the local, future-landmark building would occupy a carousel of revolving business, until eventually becoming vacant. Then something amazing would happen. With the Great Depression firmly in the rearview mirror, a new team of visionaries purchased the building at 687 Central Avenue with the concept of creating a state-of-the-art movie theater. The age of “Technicolor” movies were all the rage, and the idea of creating a conceptually stunning venue in such a unique building became a reality. After a complete renovation featuring the area’s first “floating screen”, push-back chairs, air conditioning and a smoking lounge, State Theatre was ready to open their doors to excited cinema goers on May 1st, 1950. “The Outriders”, a country-western film starring Joel McCrea was the first ever film played in the expansive new theater. The theater would enjoy success for over three decades, before ultimately going out of business in the early 1980’s. One walk in the door, and you can’t help but feel the evolution of this grand building. Over recent years, State Theatre: the concert venue has become one of the premier destinations for a diverse and vibrant music scene. Hosting exciting acts ranging from up and coming local talent, to Grammy winning artists such as Bon Jovi, artist showcases, and avant-garde theatrical presentations, the State Theatre truly continues to “wow” event attendees of all genres. To this day, 687 Central Avenue still holds the beauty, grace and dignity of her “almost” hundred year existence, equating to a one of a kind, unparalleled concert experience to be honored for the next hundred years.